We are continuing to experience great success in acquiring data for our Prisitonchus connectome project. Here’s an image showing how far into the worm we are with our current dataset. In it you can see the terminal bulb of the pharynx, and if you look very closely you can see the amphid commissures, which contain most of the nose sensory organs. The image is taken very close to the duct for the secretory/excretory system, which can also be seen very nicely in the image. It looks like we should be able to switch to worrying about the tremendous task of describing all of the synaptic connectivity in January. Metta and I have been working very hard to collect these data as fast as we can.. in fact I’m sitting at the electron microscope while typing this post! I’ve added a couple of images to my Pristionchus Flickr album HERE. 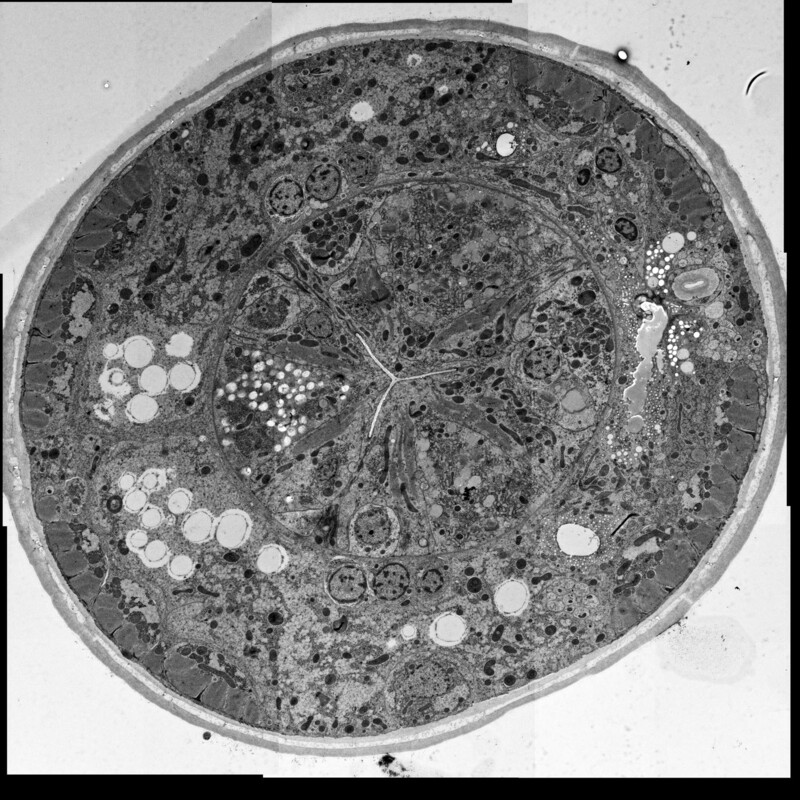 Metta and I are still in the process of collecting images of a serial section dataset through the front end of our nematode. I am hoping it will eventually become the second species for which we have a complete connectome, or “wiring” diagram of all the synaptic connections in the nervous system. We have now imaged everything from the tip of the nose to the brain of the animal, which is called the nerve ring as it wraps around the pharynx making a ring shape. Everything is going exceptionally well, and we only need a few hundred more images to have a very complete and useful dataset showing all of the connections. 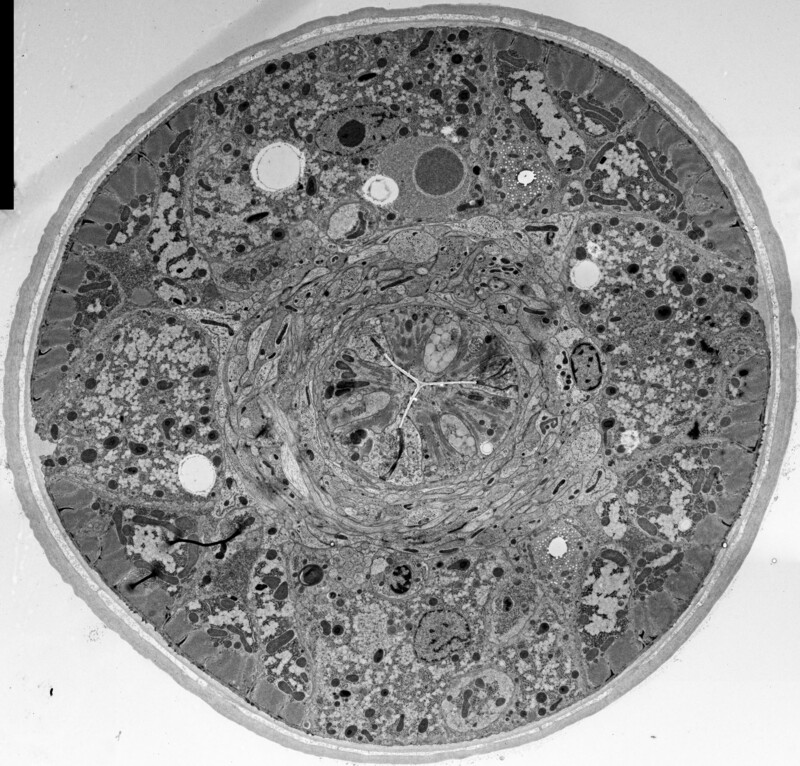 The above image is a cross section of the nematode. 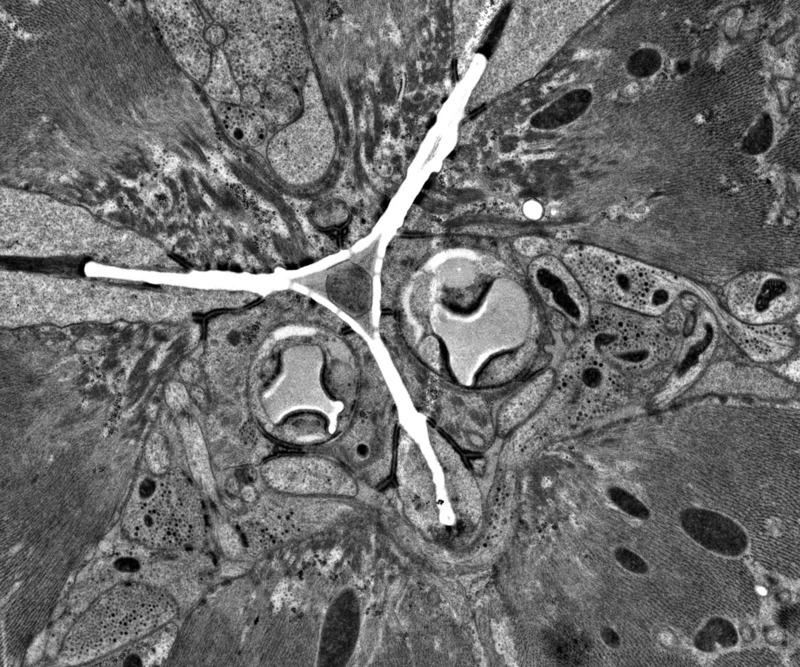 The pharynx is in the middle, and you can see the neuropil wrapping around in a circle, forming synapses as they pass each other. All of these images are taken at much higher resolution than is shown here. Click HERE for a Flickr gallery showing the same image at different magnifications. Finally, after years of tedious work, we have our first very high quality thin section series through synapses in Pristionchus pacificus. This image is of the nerve ring in the pharynx, which controls many aspects of feeding behavior in the nematode and is like a mini-brain. It is very difficult to obtain such data and few groups have done it, so this is no small victory for me. We have a long way to go though, as the “real” brain of the animal is still hundreds of sections away, but if things continue to go well we could finish this in January or early February. The triangular white structure you see in the middle is the lumen of the pharynx, through which all of the food passes. In fact, there is rather conveniently a bacteria in the center in the process of being swallowed by the worm. Clusters of black spheres in the smaller cells are synaptic vesicles, and the black blotches on the cell membrane adjacent to the synaptic vesicles are pre-synaptic densities.. on the other side of each synaptic density is the cell each neuron is “talking” to. The two irregularly shaped holes near the pharynx lumen are gland cell ducts, that fuse with the lumen a few microns from this image and likely secrete digestive enzymes. Filamentous structures radiating out from the lumen are muscle cell filaments, used to open and close the lumen. Beautiful, isn’t it? New Pristionchus polyphenism paper out!